Scattered Joy: My First Award! My new blogger friend Michelle at Heartfelt Balance, Handmade Life has awarded me with the Versatile Blogger Award. Thanks so much Michelle! 1. My husband & I romanticize about moving somewhere remote where we can live off the land and off the grid. I've even researched composting toilets - and humanure! 2. And on that subject - one of my favorite gifts ever was the Mother's Day my kids arranged for a truckload of manure to be dumped in our driveway. I guess they had tired of hearing me complain about my crappy clay soil. 3. Which leads me to my next point (hey, this is easier than I expected!) - I love to garden. My passion is for native flowers, trees and shrubs - especially Canadian woodland plants. 4. I am in love with the Canadian wilderness and I tried pass this love on to my kids, which meant we spent many vacations camping, canoeing and hiking. 5. You may have guessed by now - I'm a tree hugger. I compost my kitchen scraps, recycle EVERYTHING, use re-usable canvas shopping bags, buy phosphate-free laundry soap and environmentally friendly cleaners, use energy-saving appliances and light bulbs, drive a fuel-efficient car, AND my new carpet is made from re-cycled water bottles. Oh - and I sail. Does that count? 6. I sail! Last year, without any real experience, my husband & I bought a sailboat and taught ourselves to sail. We keep The Interlude (good name, right?) on Lake Huron, one of the Great Lakes. 7. For my birthday, my husband bought me an inflatable life jacket. Yup, he did! And I love it! Sailing! Fun! All my husband wants to do is jump out of planes and off of things. Totally not my cup of tea. I would love sailing though. Your husband is into sky-diving?! Now that takes courage! Thanks again for the award, Michelle. You've got good taste kiddo. I already read a number of these blogs daily. 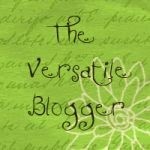 Kara - I want to thank you very much for the Versatile Blogger Award! I accept it with all the accolades you lavished upon me in your very kind email. Bodacious Boomer: Thanks! I hope I was able to introduce you to a few new ones. 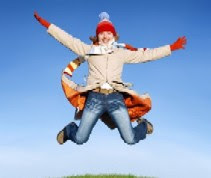 April: I LOVE getting new followers! I've also added my blog to your Blog Hop - thanks for the invite. Very cool Kara!!! Thank you so much. I'm honored. And I enjoyed how you listed your seven tidbits, worried it would be hard, but finding each one linked into the other. Keep tree hugging! You've made my day! Thanks Kara! I think you did a fantastic job of 'sharing' We've been watching programmes about the Canadian wilderness and Hubby desperately wants to go and hang out in the wild now. He has his own axe so maybe I should let him go. Seriously it looks phenomenally beautiful and wild in Canada and we shall certainly visit in the near future. No wonder you love it. Mightily impressed you can sail. Hubby hates boats so that's not really an option.well, listening to him heaving over the side isn't my idea of fun. Thank you so much! I am embarrassed to admit I have received this one in the past but that won't stop me shouting out about it in a post soon so huge thanks for thinking about me. And I forgot to say the most important thing which is 'well done!' I think you really deserve this award. I for one really enjoy my visits here. very cute blog - love it :) new follower from well-to-do blog, cheers! Congratulations on your award! You have such a cute blog! I am a new follower from the blog hop! I would love it if you stopped by! I have some amazing handmade giveaways going on! Take a peek! Hello Kara! As you have probably noticed, I am a bit slow at keeping up with my emails ;-) Thank you ever so much for the award, I am honoured to be in with such auspicious company! Woo hoo! Thank you so much! This is so sweet of you, and I appreciate it very much!